Erica Klein grew up in Monterey, California and currently lives in Los Angeles. She is known for her feature role in Elliot Moss’ music video “Without the Lights” directed/choreographed by Phillip Chbeeb which went viral on Facebook receiving over 50 million views. She has performed in the Target Grammys TV commercial “In the Middle” feat. Zedd, Maren Morris and Grey. Erica plays a lead role in the movie “All Styles” and choreographed Lauv’s music video Superhero in collaboration with Josh Killacky. You can find her in various music videos for artists including Trevor Wesley, Alyson Stoner, Every Time I Die, Smallpools, and Cobi. She has worked with choreographers such as Kathryn Burns, Ryan Heffington, Jojo Gomez, Ian Eastwood, Nick Demoura, Eden Shabtai and Christopher Scott. 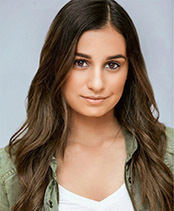 Erica also directed and choreographed and the Exes’ music video “Cain” and Ricky Palomino’s music video “Ricky’s Song”. She has performed at the Disney Concert Hall with the Cal Phil Orchestra and assisted Phillip Chbeeb for Camilla Cabello’s performance at the MTV Billboards Awards Show. Her choreography has aired on Jennifer Lopez’s World of Dance TV show both in Season 1 for contestant Diana Pombo and Season 3 where herself and Aidan Carberry competed as a duet act. She loves teaching and has guest taught in India, Mexico, Singapore, Amsterdam, France, Belgium, Canada, Russia, Sweden, Israel and almost every state in the United States. Erica hopes to continue developing her unique style and inspire other to push the boundaries of the contemporary dance genre.